3 Waterproof Electric Skateboards That Won't Disappoint You! →3 Waterproof Electric Skateboards That Won’t Disappoint You! Most of the skateboards are not made for wet weather. Water gets into the metallic parts and causes rust, making bearings seize up and stick to your truck. It makes the bolts rust making it impossible to get the nuts off. It gets into wooden boards and causes delamination, stress fractures and decreases strength. As you can tell, water is really bad for longboards … and even worse for electric skateboards because of the electric components. Fortunately, there are a few ways to work around this. A few electric skateboards (“esk8”) manufacturers have produced some water resistant skateboards. In today’s article, I will highlight some of these boards for you and go into depth about what makes them waterproof. If you live in an area that’s wet most of the year, this article will be helpful for you. This is the cheapest esk8 on my list and great for those on a budget. It’s actually on our list of best esk8’s below 300 bucks. It comes in at 27in long and 9.37inches wide. The deck is made from a plastic composite. This allows it to be waterproof but also cheap to manufacture, which keeps overall costs low. However, it does have a maximum weight of 176lbs. The deck borrows the same technology the Inboard uses and stores the skateboard battery inside of itself. This protects it against the elements and makes sure water doesn’t easily get in and damage the battery, esc or Bluetooth receiver. Again like the Inboard, it uses a hub motor. This motor is water resistant and is cheap to produce. Perfect for an affordable waterproof electric longboard. The Maxfind uses a single motor and takes you to a moderate top speed of 23 mph depending on your weight. You also get decent mileage and can go as far as 6 miles on its premium Samsung battery. It also only takes battery 1 hr to fully charge. If you’re a light rider and need waterproof deck, this one is perfect for you. You can learn more about the details and see more pictures on Amazon.com here. The first board on my list is the Inboard M1. This board makes use of the waterproof abilities of fiberglass/composites for its deck with a flexible wooden core for vibration dampening. You’ll have a stiff, light and strong board for maximum control at fast speeds. Heavier riders will be able to use this deck with no problem. The deck is 37.5in long and 11.25in wide, meaning it will be comfortable to stand on and ride for long periods too. It uses large 79mm and 78a soft wheels for added comfort. The use of composites also allowed Inboard to experiment, they enclosed the electrical components within the deck. A simple and effective solution with a stylish finish. This means the electrics are sealed and totally safe from the elements and water damage. The Inboard appropriately uses hub motors. Hub motors are the most water resistant motor option. They are sealed with rubber and don’t let water get in easily. Aftermarket high-quality Caliber V2 trucks are used. These will be super stable at the fast 22mph this board can go. Altogether this is a pretty good waterproof electric skateboard that has quality parts, the high price is a reflection of its quality and it will be worthwhile. The most expensive board on my list. This esk8 spares no expense and goes the distance in order for it to be the best waterproof and all-round electric skateboard you can get. It uses an alloy deck that will both be strong, stiff and water resistant. The trucks are CNC made. This means the trucks are cut out from an aluminum block as opposed to normal trucks. This makes them more precise and thusly stable at higher speeds. 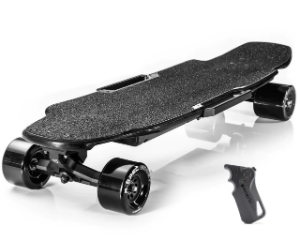 The skateboard’s battery has a large capacity and will take you 25 miles and will charge twice as fast as other skateboards (it has a 4A charger and most others are 2A). The battery and electronics are enclosed within a plastic box that is easily accessible and will provide adequate protection against water. It uses 2 water resistant hub motors at the back, they are powerful and will take you up to 28mph. Though I don’t recommend skating that fast in the rain, it would be easy to fall. The esk8 is very heavy. If you don’t need to carry it around much and want a powerful, long-range skateboard, I highly recommend it. Things need to know about skating in a wet weather. What types of decks are waterproof? Most decks are made from wood which is not water resistant. Some companies seal them with honey wax, paint and other varnishes, but this leaves the mounting holes vulnerable as they won’t be covered. If water gets in them, they can get weaker. 100% waterproof decks are made from composites. Fiberglass, carbon fiber, plastic etc. All have waterproof characteristics and won’t be affected if they are in the rain or wet for a long time. Are there any other parts that aren’t water resistant? The boards might be water resistant but some of the other parts will not be. 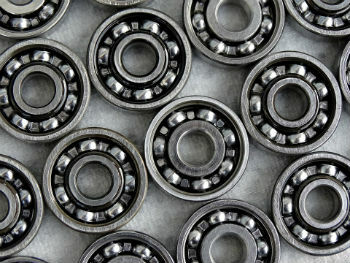 For example, bearings can easily rust after being in the rain for a while. I highly recommend you take them out and clean them after riding in the rain, or simply spin them a few times (after like 1hr after riding) to prevent rust from building up in the bearing causing them to cease up. Cleaning and lubing them is the best option but spinning them works if you don’t care about how long they will last (like me …). Finally, you can buy aftermarket ceramic bearings that will work well in the rain and won’t rust. Most will require you to spin them as they will have metal outer and inner rings which can still rust. If you have a waterproof deck you won’t really need to maintain it. I recommend wiping it down for cleanliness and to stop dirt drying on it. Trucks made from steel will not rust and the wheels won’t need any maintenance either. The bolts and nuts will rust though, if you can wipe them down once a week (or two) please do so. It is important that water does not get into any of the electronics. If you happen to break the plastic container for them, tape it up or use glue to seal it. If water gets in it could very quickly be game over for your longboard. Water resistant means they won’t let water in easily, but if you skate over a puddle or submerge the skateboard in water, a little bit might enter. For example, hub motors (which are self-contained) are water resistant but skating in wet conditions could make water get into them. To learn more about hub motors, click the link to see how they work. 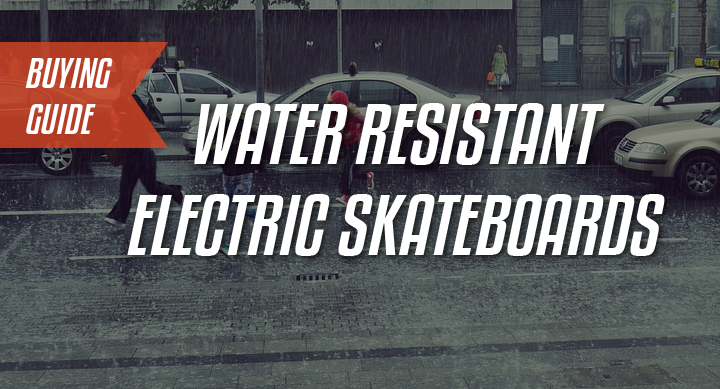 Water-proof means that the skateboard can be submerged in water and not let a single drop in. Skateboard technology has not yet reached this but we are close. You are definitely running a risk if you skate it in the wet. If you haven’t yet settled on a board I recommend the ones mentioned above. They are built to be water resistant and very low maintenance. Using an inappropriate board in the rain will shorten it’s working life, spoil the electronics and even make the wood soggy. An all-weather skateboard means you can skate rain or shine without having to worry too much. Don’t skate through any deep puddles though. If you haven’t decided yet, I recommend you pick up the Inboard. The quality is worth the investment and it has a warranty should any parts not work as advertised.